Law librarian with interests in research, tech services, baking, books, and pop culture. I made over 180 cookies for my sister's party to celebrate her 10-year battle with brain cancer. She requested cookies to give as favors. How could I resist? 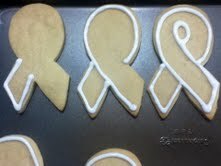 I used a ribbon cookie cutter that I bought at Pryde's Old Westport many years ago. If you are ever in the Kansas City area, then you must visit Pryde's. Be sure to plan a few hours to explore. I placed 2 cookies back-to-back in clear cello bags from Michael's. I attached these lovely tags from Vintage Indie which tied into my sister's theme of LIVE LOVE LAUGH! This is the piping order I used to create the ribbon's tie. It was hard for my brain to get a grip on this to make it look more like a ribbon. I think the end result is kind of fantastic. This is the biggest batch of cookies I've ever baked and decorated. Cookies took over my freezer, kitchen, house, and life...but it was definitely worth it! Now that's a lot of cookies.